Beautiful. Alluring. Gorgeous. Perfection. Amazing. Exemplary. Smart. Revolutionary. Stunning. It’s everything you could dream of and more. 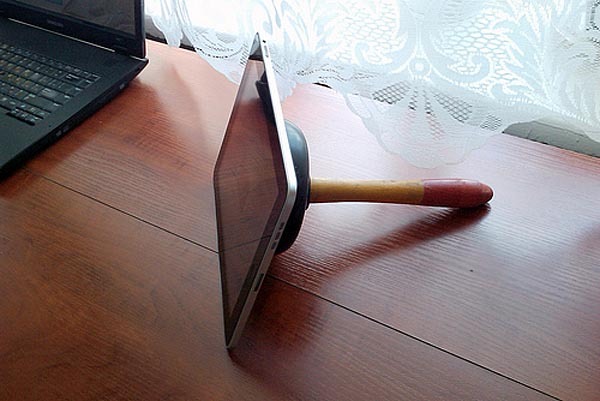 This amazing iPad stand will be the envy of everyone who sees it, because who doesn’t want a toilet plunger resting on their desk? Featuring a handsome wooden handle and a ravishing lightly used black rubber cup (complete with mystery sediment stained around the rim), this gorgeous toilet plunger is easily the best toilet plunger to ever grace the iPad as a stand. You want one? Of course you do. You can hardly contain your buying impulses when such a beautiful product arrives on the scene, and you’re in luck, because for a limited time this luxurious iToilet iPad Smart iPlunger is discounted from it’s regular price of $799 to just $7.99 on Amazon making that at least a 631,811,724% discount. This iPlunger is so amazing it will pay you in glory for years to come, and not only does the iPlunger Smart iStand work to prop up an iPad, it will even unclog a toilet or drain for you. That’s at least two uses from a single groundbreaking product. Unfortunately the soiled sediment staining is not available on the discounted model, but what an adventure that will be to customize your very own design. Look at this world class beauty. 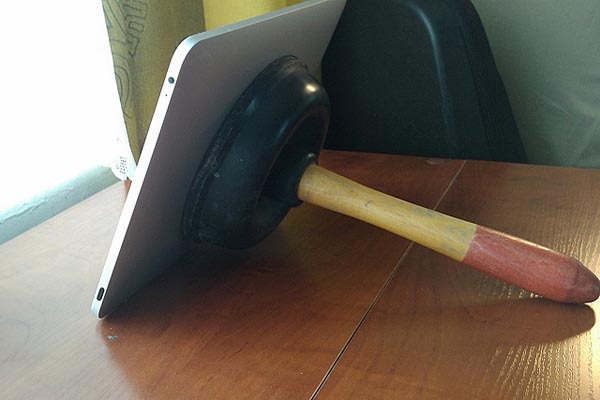 Seriously, a little plunger can function as an iPad stand! Is this hilarious or what? And yes you can actually buy one, though you probably don’t want to use it for, uhm, household purposes, as well as your iPad anyway…. maybe get two then so you can have one for each usage. OK you probably figured out by now that it’s April fools day, meaning the internet is officially useless for 24 hours. Of course we have to do our part to contribute to that. I recall seeing these plunger pictures floating around the web quite a while ago, though I have no idea of the original source, if you know where these originated from post in the comments. Thanks to Daniel for sending this in. Well, u can buy mini versions of a plunger for iPhone as stands. So this could be real!! Even if it was faked up for April fools day!! 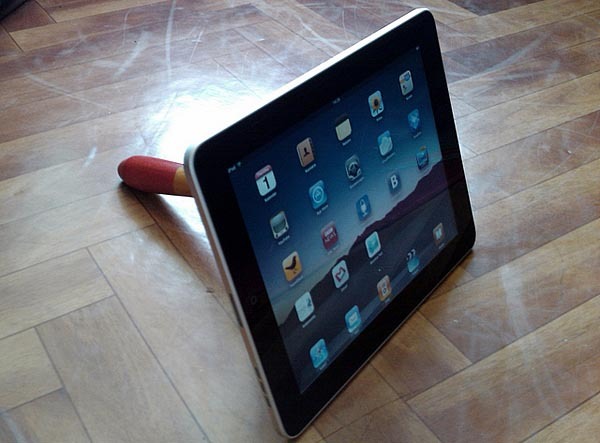 A sanitized plunger would make a great cheapo iPad stand. I know this is a joke but this actually works and they sell little suction cup stands that look like plungers. For $5 or whatever that’s not so bad and it’s much sturdier than a Smart Cover. Look at this beauty, this wonderful design — it’s designed by apple, right? Over here in the UK I’ve seen them for sale in gadget shops – well online gadget shops, try http://www.gizoo.co.uk or “I Want One Of Those” (IWOOT).